Man, what a crazy mixed up weekend. For whatever reason, the bank put a security hold on our debit card and it took a long phone call while at a store trying to pay for stuff to get it removed. The oddest part was it held up some transactions but not others. Unfortunately, one of the transactions it held up was purchasing a new laptop for me, but that wasn’t readily apparent until last night. Oh, well, heavy sigh. It’s all fixed now and we’re going to pick it up this afternoon. But in the midst of everything going on, I managed to accomplish one thing that I liked and planted some Autumn flowers in the yard so there’s some spots of color. Soon, I’ll be cutting down and digging out the evergreen bushes that look sad and sickly. Next Spring, we’ll be putting in various colors of azaleas and some jasmine plants in big pots. In one of my recent posts, I talked about “free food”, resprouting various vegetables in water to harvest them over and over. The two that I talked about were spring onions and romaine lettuce. I put two cut spring onion bunches in water over a month ago, and we’re still enjoying the sprouts coming off them. However, I have notices the roots are starting to look a little funky so this next harvest (tonight as a matter of fact) will be the last and I’ll start with new bunches in a few days. But it’s a wonderful idea and I’m glad to report it’s much more successful than I first thought it was going to be. Romaine lettuce, though, was a big disappointment. The first cut root I put in water rotted quickly and was tossed quickly. I’m not sure why that happened except possibly the water container was too large. The second root I put in a small container and this one was successful. I did note that the water needed to be changed every few days to avoid spoilage. But the leaves sprouted on time and kept on growing. The only difficulty was they grew incredibly SLOWLY! After three weeks, there were a bunch of leave less than an inch high. You can conceivable regrow lettuce like this, but not if you want salad more than once or twice a year. We eat a lot of salad so this likely won’t be one of my kitchen projects going forward. Tomatoes. There really isn’t a whole lot better than those round red globes of goodness. I’ve learned a little bit about tomatoes over that last couple of weeks. Most important, never ever put tomatoes in the fridge. Cold and tomatoes just don’t work well together. First, the only way for a tomato to get ripe is leave it at room temp. If a tomato has been hit by a frost, it will never ripen beyond what it is at that moment no matter how long you wait for it. To get the most effective ripeness from your tomato don’t start with a fully green tomato. Leave the green ones on the vine. When they’ve started to turn red, you can pick them and put them on the counter to finish ripening. Don’t stack them because bruising causes spoilage. They are fully ripe when the skin around the blossom end starts to wrinkle just a bit. A tomato that appears “over ripe” is at its best for making soup or sauces. Most sauce recipes say to remove the seeds and juice, but that’s the part I like best so I leave them in. Hasn’t hurt me or any sauce I’ve made. 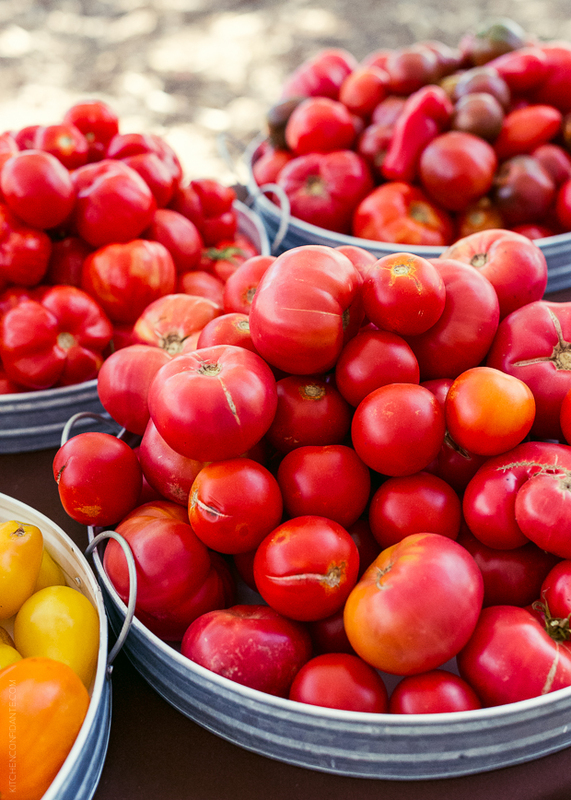 Tomatoes that are stored in the fridge will degrade quickly into a mealy, slimy mess that is completely unpalatable. If you want chilled tomatoes, put them in the fridge for an hour or two before using. Watermelon is one of the best fruits around. It’s so versatile and you can do an amazing number of things with it. I ran into a trick last week I’d never heard of. I was in the grocery store and the woman in front of me had three large watermelons. I asked her what she was going to do with so much and she said she crushed it down, put it in zip lock bags and froze it. Then, when she made lemonade, she’d take a baggie out of the freezer, break it up into chunks and put it in the lemonade to chill it and give it extra flavor. She said she also used ice cube trays for cubes to go into glasses. I’ve frozen grapes before, but never thought of freezing watermelon. Sounds like a good idea. Dinner tonight is going to be a fast and easy meal, but it’s going to be so good! Weekends are grocery shopping days for us, and typically we go every two weeks. This past weekend, though, we ran into so many deals that it’s likely we won’t go again for about three weeks. We found a deal on pork chops that one package is going to feed the two of us for four meals. So I left on part of it out to grill up today. However, yesterday, Partner/Spouse wanted to have pasta. We bought stuff to make a nice pasta and vegetable meal, but then didn’t make it because we ate a large and late lunch. So today, I’m going to grill the pork chops. When they’re done, they’re going into a warm oven to stay warm while I fix the pasta. 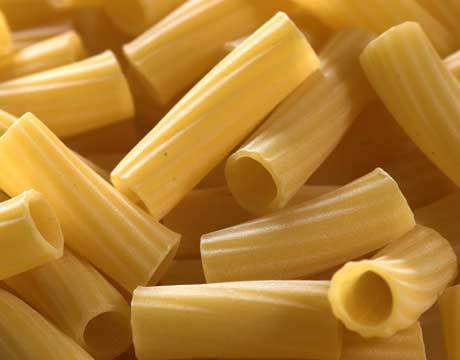 We got some rigatoni, it’s a kind of large round hollow tube cut into bite sized pieces. While the rigatoni is cooking, I am going to warm up some olive oil and infuse it with garlic. When that’s ready, I’m going to sauté some onion and asparagus tips. At the end, I’m going to chop a perfectly ripe tomato I’ve got waiting just for this and toss it into the warm oil. When the pasta is done, I’m going to put it in the oil and mix it around. Just before I serve it with the pork chops, I’m going to chop the last of the spring onions and toss it in to just barely wilt it. Parmesan on the side, of course, though I doubt it’ll be necessary. So grilled pork chops, and a hot pasta salad. Doesn’t get much better. Summer is starting to wind down and it’s time to start thinking about what to do with the produce that isn’t going to “winter over” as it’s referred to around here. Freezing, drying, and canning are the main choices for the home cook. Space is a big consideration, too. I’m lucky because the only thing I grew this year that I need to harvest are my “yarbs”, old country talk for herbs. 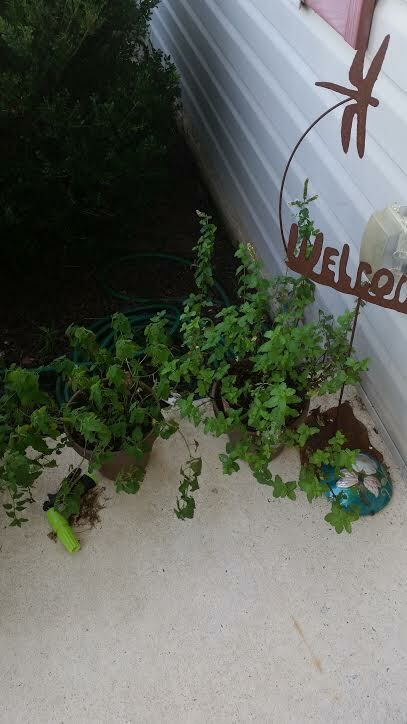 I grew two pots of basil, one pot of peppermint, one pot of lemon balm, and one pot of sweet mint. 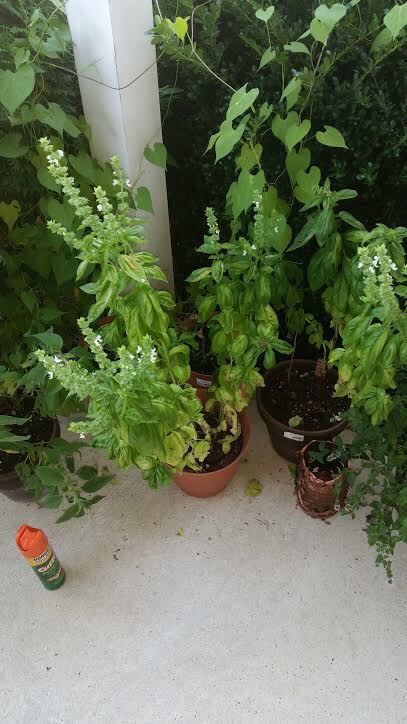 During the Spring and Summer when the herbs were growing strong and high, we used the basil for everything Italian, and the mints for salads and mixed drinks (think mojito.) So, I thought the best way to preserve my harvest would be to dry the mints and to make a an olive oil and basil puree and freeze it. Yesterday, I over watered the herbs so the leaves were as plump and juicy as they could be. It’s kind of fun to watch. They’ll get a little droopy to let me know they need watering and two hours later they’re practically glistening. 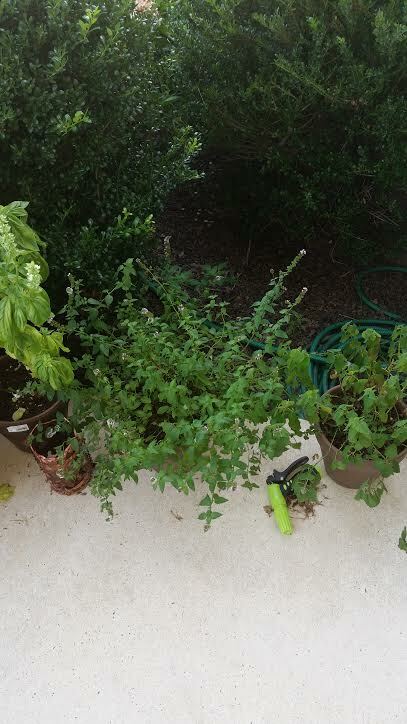 I didn’t spend a lot of time with the herbs except to pluck them when needed, and water every few days. It was so cool to be able to just wander out to the front “porch” and get what I needed. When you’re growing herbs, you want to pick them while the leaves are tender. Most of the time this is when they’re small, but allowing the leaves to grow large can also intensify the flavor. You can also extend the harvest season of your plants by plucking off the blossoms and seed heads as soon as they appear. For some herbs, the blossoms appear early, and on others they appear late. The reason to pluck the blossoms or seed heads is once they appear, the plant pours all its efforts into propagation and not into the leaves. They’ll turn brown and wither and will no longer be able to be eaten. All my herbs were blossoming. I decided to pluck only the leaves that were green and healthy looking, but I wanted to do that standing up. I decided to cut the basil at the ground level and pull the leaves off inside. Then I was going to wash them and dry them, and process them with olive oil and freeze. I ended up with an armload of stems which made a light swishing sound when I laid them on the island top in the kitchen. And about a zillion little bugs of various types scattered. Yipe! I hastily reached for the bug spray and quickly squirted everything in sight. I opened drawer, cabinets, moved things. After half an hour of searching, I was pretty sure I gotten them all. I poked through the stalks I’d brought in and found many more dead bugs and spiders, and a few that were still crawling around. I sprayed the stalks again, then tossed them in the trash barrel. Well, shoot. Now I had no basil. I contemplated that as I idly scratched my shoulder. Then moved to scratch my stomach. Then a tickle on my neck bothered me. I ran to the bathroom and tore off my t shirt and found, well, not a lot but a few bugs crawling on me!! A fast jump into the shower and right now all those clothes are in the washing machine. When I carried all those plants inside, some of the bugs had taken advantage of the new landscape and ridden me into the house. So here’s the one thing you don’t want to do with herbs if you’re raising them outside. You don’t want to ignore the fact that they are going to pick up bugs of various sizes. I had shooed away the spiders, but had ignored everything else. Or just not been aware of them. So, the basil is a total write off. The mint might not be. In the past, when I’ve grown mint, it lasts through the first frost. Bugs don’t. Since I was planning to dry the mint anyway, I think I can harvest around the first frost and it will be bug free. I’ll have a try at that and see what happens. In the meantime, I’ll start planning for how I’m going to grow herbs next year and keep the bugs off. One idea is to grown them inside. We have the perfect spot for that. Or, I can research natural ways to keep bugs off. I know one way that I’ll have to verify. For now, I’ll just keep an eye on my mint and see what plays out. And take a shower every time I feel even the slightest tickle anywhere. I’ve mentioned before that we live in a small town in a rural community on the Delmarva Peninsula in the mid-Atlantic area of the country. Twenty minutes north of us is a mid-sized town of good size and 30 minutes south of us is a large town. Between the three town, we can usually find everything we need for modern living. For everything else, we have the internet. Clustered around us are smaller towns, villages, and hamlets. 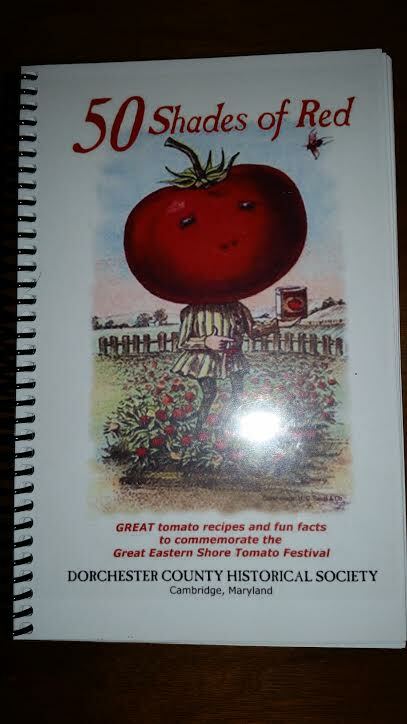 One of those villages held the Great Eastern Shore Tomato Festival this weekend and we went to it. It started at 10am so we headed out about 10, not wanting to be there at opening. After a few mis-starts, we finally were on the road at 10:30 and arrived just before 11. We drove down one of the main roads and encountered a young man, sitting in a lawn chair in the middle of the road. He directed us to the parking area where an older (much) man told us where to park and where to pick up the tram that would take us to the festival. It’s hard to tell in this picture, but that’s a tractor pulling the tram. We sat all the way at the back. Once we knew where we were going, we found it was only a few blocks away. A lot of the locals took advantage of the day and held yard sales. We didn’t stop at any of them, though. Far too tempting. So we arrived at the festival. It was right on the Nanticoke River Riverwalk pathway. The first booth that greeted us was from our favorite local winery allowing adult to have free tastings. I didn’t want to start the day drinking wine so we bypassed that booth, but took in several others along the Riverwalk. We had just missed the opening event, the Mayor’s Tomato Challenge Race where contestants had to run a short course while carrying tomatoes in spoons. The day was sunny and warm, but not hot. At least, not to us. Several venders tried to sell us hats or caps, but we declined. Turned out to be the wrong thing for one of the three of us. Since Partner/Spouse and I had been to this little town before, we were pointing out all the sites. 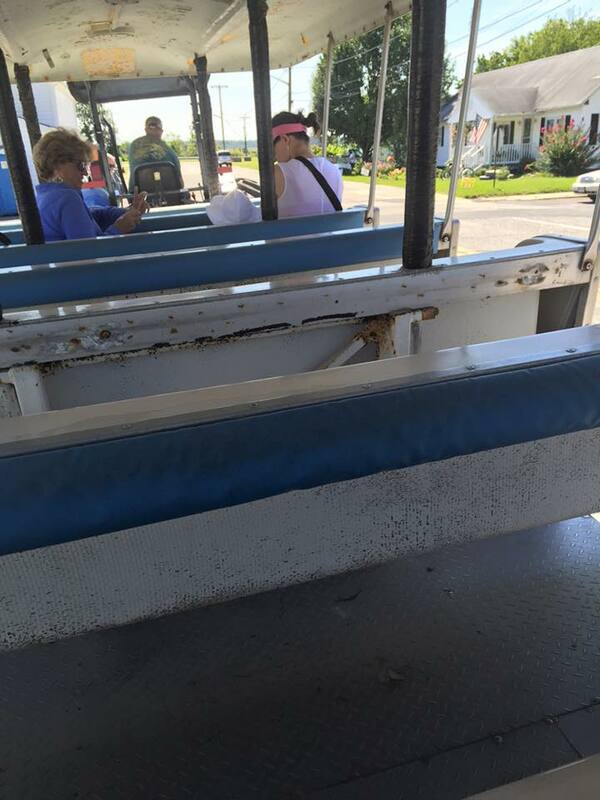 We had just arrived at the main area of the festival when we were startled by a loud clanking and boom. Then a loudspeaker announced they were starting the Punkin Chuckin. The intent was to launch pumpkins across the river. Every few minutes, the clank and boom would sound and the pumpkin would launch based on some festival-goer’s aim. None got across the river while we were there. Then we found our prize! One booth was set up for Friends of the Library here in our town. And the ladies recognized us from the times we’d been in. We didn’t go crazy, but we got several books, about a dozen, and paid only $6. I think they cut us a break. From there, we went to the local animal shelter’s booth and played with puppies and young dogs. We explained that we have two rescued dogs and had just lost our third, so they didn’t press us too hard to take any home. Partner/Spouse stopped at a booth where he talked with a volunteer organization for our town and county about controlled growth to maintain the area’s culture and history while still bringing in the jobs and growth necessary. I was at a booth where there were sheep being sheared, and wool being spun into yarn. The main topic of conversation was my t shirt which said “Sarcasm: the official language of the Irish”. Our final stop for the day was at a booth where they had models of boat called skipjacks which run up and down the rive and the bay harvesting oysters. Turns out they run tours out of our town, just a couple of miles from our house! At 2pm was the great tomato war, but we weren’t there for that. 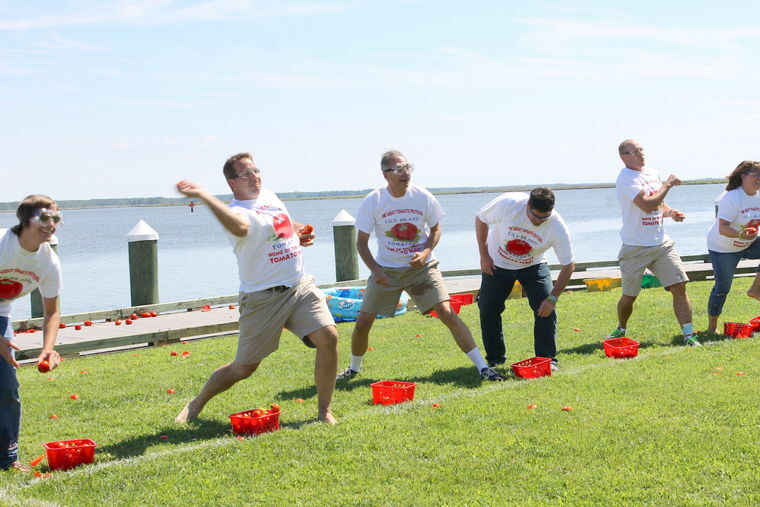 There was also a watermelon rolling contest, and a peach pit spitting contest. Didn’t watch those either. We were long gone by then. But, we were so inspired by the festival we went to our favorite farmer’s market and stocked up on various veggies, including tomatoes. It was a fun day, a very small town kind of thing to do. It was the kind of thing that I love and it was a blast for me. I’m glad we went. Post #405 Guess What’s For Dinner Tonight? August 21, 2015 at 12:21 PM | Posted in Uncategorized | Comments Off on Post #405 Guess What’s For Dinner Tonight? Perusing the pantry, and I got choices. What to make, what to make? It’s gotta be Italian cuz guess what we got yesterday? YES!! 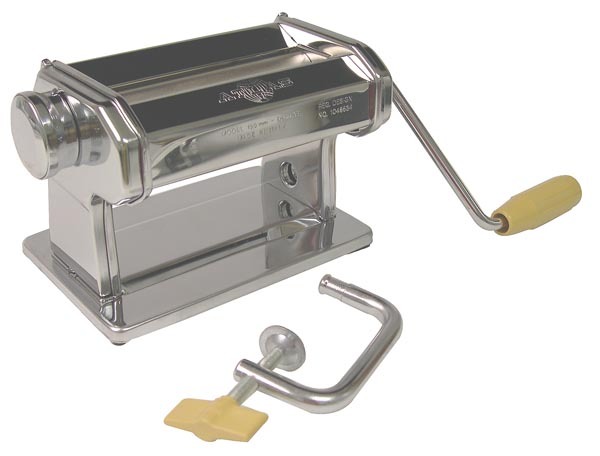 I can start making homemade pasta again! Dried pasta is good, and I like the great shapes it comes in. But there’s not much better than fresh pasta. It cooks up in seconds, well, maybe minutes, and the flavor is like the difference between mass produced bread and homemade bread, like grocery tomatoes and one picked ripe from the vine. And I can control the ingredients. It really isn’t all that hard. It’s just unfamiliar at first. So, okay, gotta be Italian. I’ve got cans of tomatoes and I can make a quick and delicious marinara sauce, but what about something different? Hmmm, I have two cans of cannellini beans. And I have two pots of basil growing outside. I have garlic. I have lemon and lime. I’ve got onions and garlic. I’ve got some scallions. I’ve got all kinds of herbs. Yup, now I know what I’m going to make. First, cannellini beans. What the heck are those? Sometimes they’re called white kidney beans and they’re a staple in Italian cooking. They’re grown primarily in Central and Southern Italy, but can be found all over the world. Sometimes they’re mistaken for Navy Beans, and there’s no harm no foul in that, but cannellini beans are closer to kidney beans than Navy beans. Cannellini beans can be found in all kinds of recipes. Sometimes they stand alone, just a bowlful of cooked beans with a little salt. (I’ve heard that some parts of Italy eat them dried, not cooked, but I’ve never seen this, nor have I tried it.) Most often, they’re found in soups or salads. I make a seven bean soup (I’ll share the recipe soon) which has cannellini beans, among others. Minestrone has cannellini beans as a staple, as well. Cannellini are a main stay in salads, too. They can be found in most of the tuna salads and chicken/fowl salads made in Italy. They add important proteins and other nutrients. One of the most important things about cannellini beans is they are easily digestible so they don’t normally have that dreaded side effect beans are so well known for. So! Back to dinner tonight. Sorry, I don’t have any pictures of it, but since it’s going to be fresh made everything, I can’t make it in advance. Here’s what I’ve decided to do. I’m going to make fresh fettucine. I’ve posted about that before. I can’t wait to get started on that. I’ve already thawed out a large chicken breast so I’m going to cut that in half lengthways and make two cutlets and grill them. I’m also going to steam some broccoli to have on the side. For the sauce, I’m going to sweat some onion and garlic in olive oil and add some basil at the end. I’m going to take a can of cannellini beans and dump the whole thing, juice included, into the pan to heat and simmer. While they’re heating, I’m going to mash them roughly with a fork, leaving about a quarter of them whole. 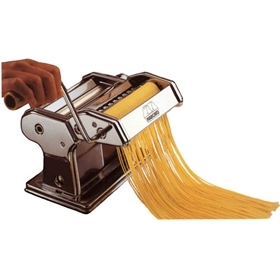 When the pasta is finished cooking, I’m going to move the pasta directly into the pan using a pair of tongs rather than draining it. That will put the right amount of pasta water into the sauce, giving it a chance to thicken. I’m going to toss the pasta in the sauce and let it simmer for just a couple of minutes before transferring it to a platter. I’m going to sprinkle some freshly cracked black pepper over it and some fresh basil ribbons, and serve it with the broccoli and chicken. 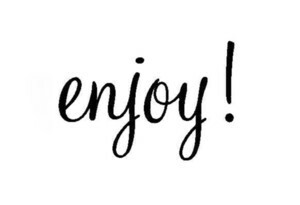 Hope it’s all good. Pretty sure it will be. Post # 404 It’s Tomato Time! I wasn’t feeling my best earlier in the week. I was up late a couple of nights working on a writing project which I managed to complete a major step on. I picked up a light touch of a stomach bug going around. On Monday, my appetite was starting to come back and I was suddenly hungry for one of those tomatoes. I cut the top end and bottom end of one off and ate them while building a tomato sandwich. I had fresh made bread and the size of the tomato was the same size as a slice of bread. I sliced the tomato into four equal slices and put on slice on each slice of bread and sprinkled them very lightly with salt. I topped two slices of tomato with cheddar cheese slices then put the other slice of tomato and bread face down on top of the cheese. Bread, tomato, cheese, tomato, bread. Two of ’em. Ripe and juicy tomatoes. They were so good. I still had plenty more. We had a salad last night that took half of one more tomato. There’s always the stuffed tomato. The way I like them. 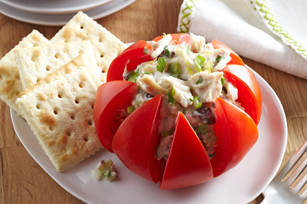 I make a savory chicken salad and cut the tomato into wedges without cutting all the way through the bottom. I spread the wedges apart and stuff the chicken salad into all the crevices and open spaces. Chill and eat. But there are other things you can do with tomatoes and I’m going to tell you about a couple. These two dishes can be made to feed one or two people, or a crowd. They’re simple, look elegant, and are so tasty. First one is a baked stuffed tomato. It’s a hot version of the above, but uses a different stuffing. Take two large tomatoes and cut the top off and discard. Use a spoon and gently remove seeds and pulp placing them in a bowl. Brown a half pound of bulk breakfast sausage, drain, and cool. Shred a cup of cheddar cheese. Finely chop several leaves of fresh mint and mix with a half cup of panko bread crumbs. Use aluminum foil to make rings for the tomatoes to sit in. Mix all other ingredients together, using only enough of the reserved tomato pulp and seeds to moisten the rest. Divide the stuffing between the two tomatoes being careful not to break the tomatoes. 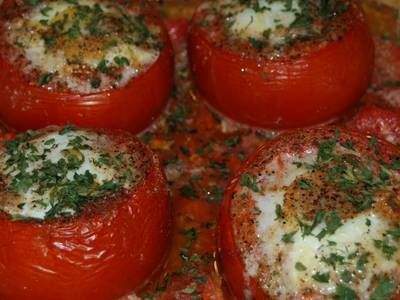 Top with a sprinkle of parmesan cheese and parsley. Bake at 375 for 15 minutes until cheese is melted and brown and tomato skins are wrinkled. Serve warm with toasted bread and a salad. The other one is a tomato tart. You can make this for one for eight. 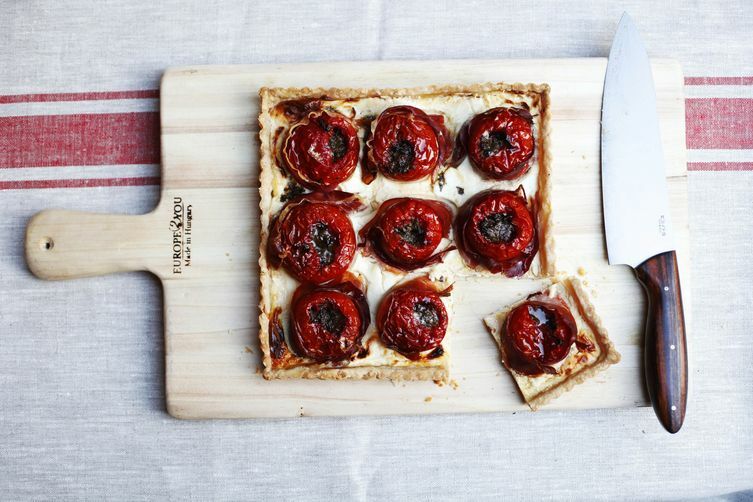 There are a bunch of different ways to make a tomato tart, but this is an easy way to do it. Thaw out a package of puff pastry and heat your oven to whatever temp the package says. Spray a baking sheet with non-stick spray. When the puff pastry is thawed, cut a piece for the bottom section large enough to hold the number of tomatoes you’re going to use. Then cut strips of pastry to build up the sides. Use three strips per side. Then it’s time to get creative. I generally put grated cheese on the bottom and I mix up the kinds of cheese I use. You can also omit the cheese and just put olive oil brushed on the bottom. Then sprinkle chopped herbs, either fresh or dried, remembering that dried herbs have a more powerful flavor so you need less. Then sprinkle some fresh capers, and some chopped olives of various types if you want them. You can also sprinkle chopped anchovies if you like them. Sprinkle finely minced garlic evenly over the crust, then add some bacon bits, or prosciutto slices. Then take your tomatoes and cut them in thick slices. Arrange them on the pastry crust either overlapping or in a single layer as shown above. Drizzle a small amount of olive oil over the tomatoes, then a small amount of balsamic vinegar. Sprinkle with a little salt and a little of the same herbs you used in the crust. Bake according to the puff pastry instructions so the pastry puffs and browns properly and the tomatoes cook through. Cool for a few minutes, then slice and serve.